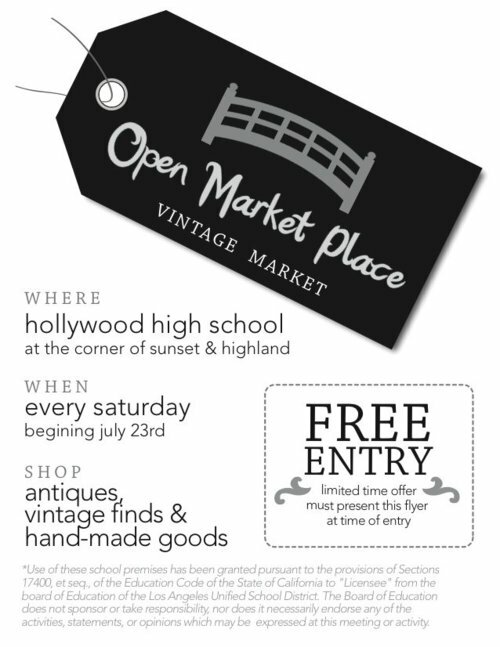 Every Saturday at Hollywood High School, you can now stroll a NEW Open Market Place! Expect to find vendors including: antique furniture finds, hand crafted trinkets, trendy food trucks, vintage fashion, handmade jewelry, live music and more. Each Saturday through August and part of September, the Open Market Place will be FREE to attendees. After the September 10th GRAND OPENING, it will cost $2.00 for adults and $1.00 for children, students and seniors. Oooh I’m so excited!! Great find! Thanks for the lead! Sounds fun..I can’t wait to go!! !